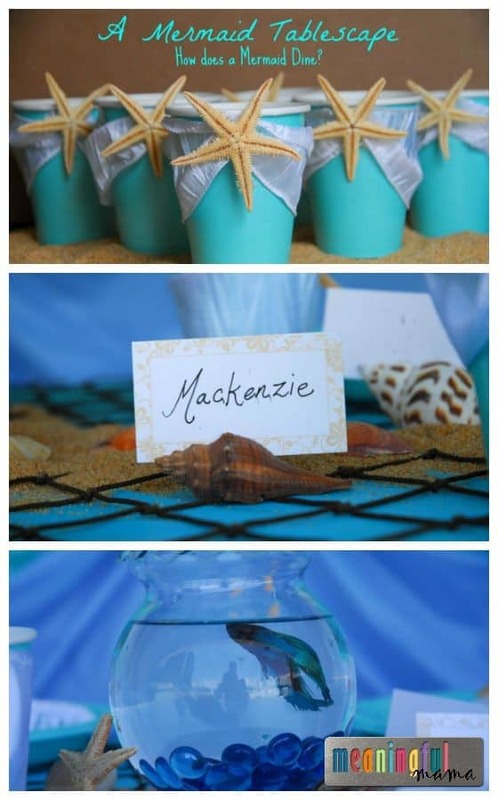 Mermaid party table decorations are important in helping create the perfect atmosphere for your little mermaid. Here are some fun ideas that are fairly inexpensive to create. 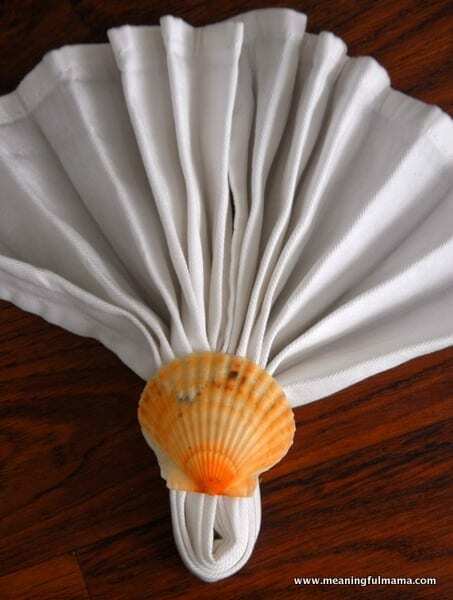 It will help you feel like you are dining under the sea. As with the rest of my blog, I want to break it down for you tutorial style. For some people, just looking at a tablescape seems completely overwhelming to try and recreate. I want to break it down to show you how simple it can be. I hope you are inspired in your own party decorating. 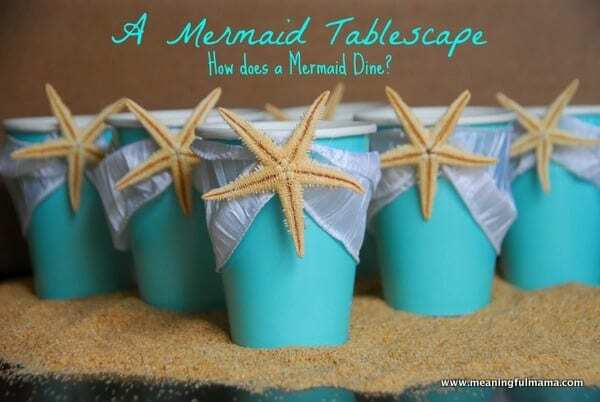 If you need to know what kind of food to put on a mermaid table, please see my Mermaid Menu. You can see the entire party too! 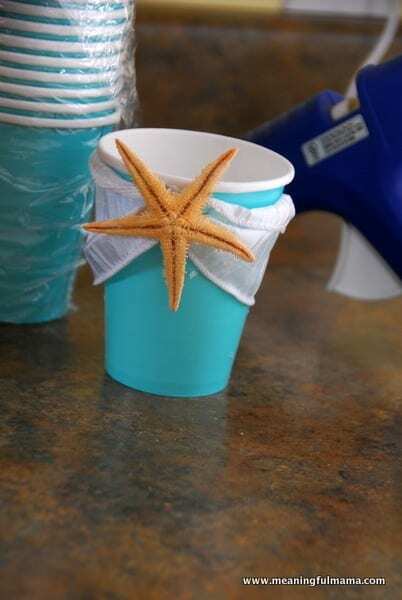 You will need a hot glue gun, ribbon, star fish (Amazon links below but you might also find them in your own local craft store) and paper cups from Party City. A couple of the reasons I chose Party City is because their prices are super reasonable and they have more color choices than I have found anywhere. I had this great ribbon on hand. All I did was cut the ribbon to length (measured it by just looping it around the cup and then cut the amount needed quickly), letting it droop a bit in the back. I made sure the seam was in the back and then hot glued one end of the ribbon to the front. I then wrapped the other ribbon around and hot glued the other end in place. It looks kind of ugly at this point, but it won’t for long. 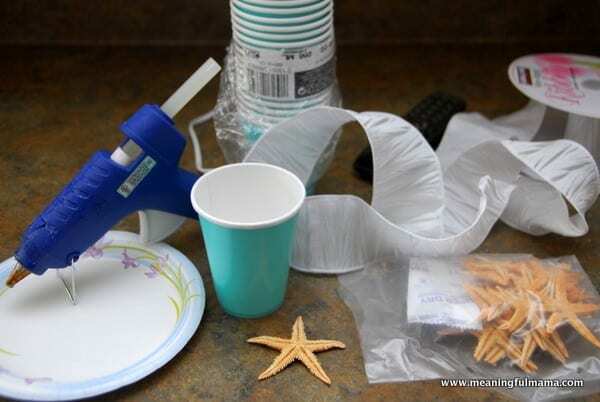 The final step is to hot glue your sea star in place. How easy is that? 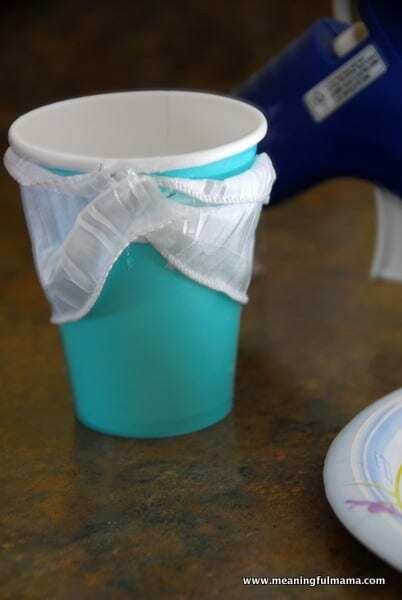 You have transformed a paper cup into a cup fit for any mermaid. There are other options on Amazon too, but I like the amount and variety in this bag and know it would be great for other decorating for any mermaid, under the sea or beach party. 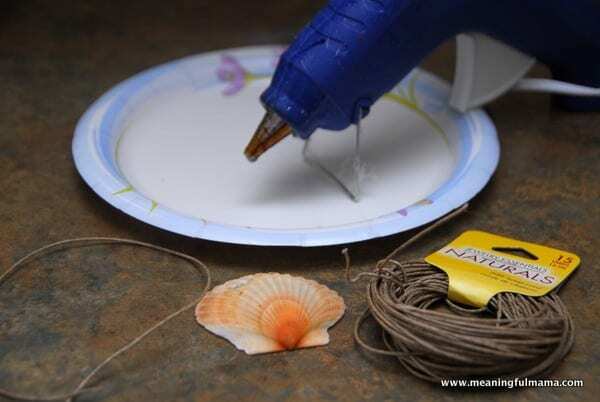 Add a dab of hot glue in the center of your shell. Set the string in the middle and let it dry. Just to make sure it was secure, I put another dab of glue on top of the string. Here are all the finished shells. 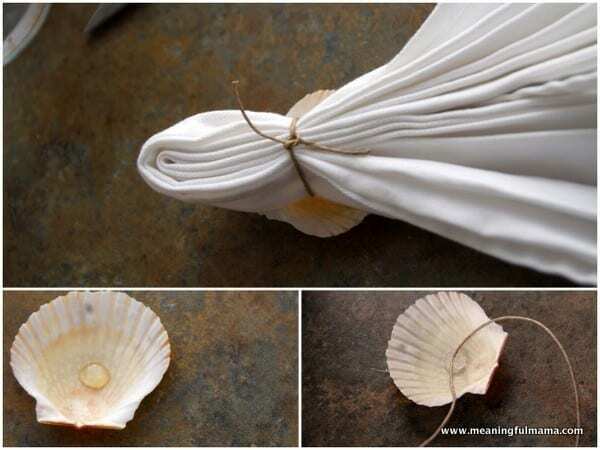 Once they are dry, just tie them around the napkin, which I folded like a fan. Here’s the table setting put together. I got the matching plastic plate from Party City as well. 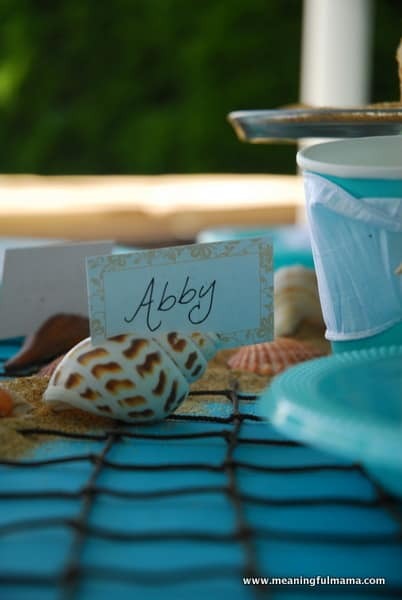 Another fabulous product I got from Party City was these wonderful place card sea shells. 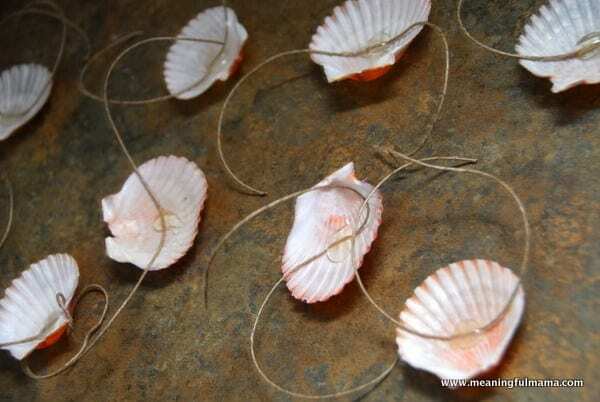 Each shell is unique, and they added such a special touch to each place setting. You’ll be able to re-use these over and over for parties. 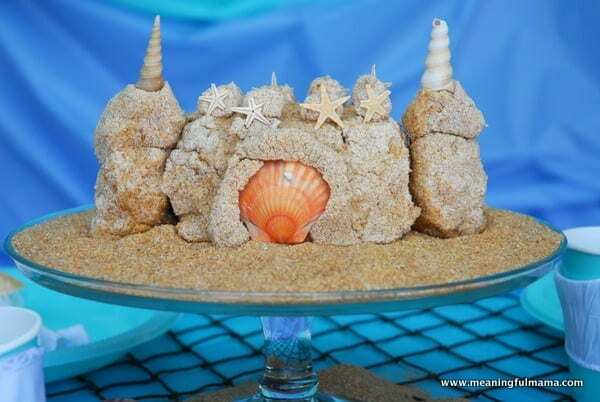 Our center piece was our homemade sand castle that will last set on a clear cake plate. This was a really fun craft we did last year, and we were able to do it again for this party. 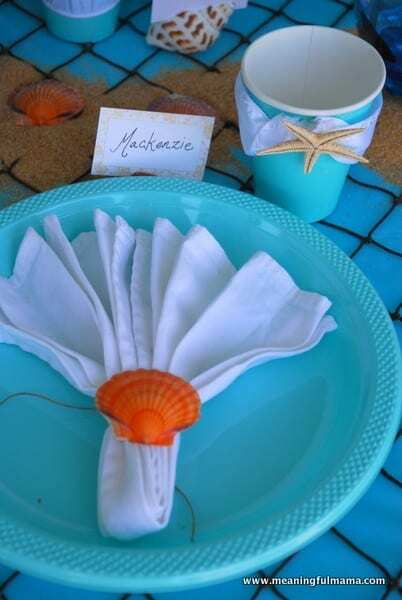 So, whether you have a beach party or not, this craft is just fun to do. I bought sand at our local craft store. It was decorated with our sea shells and sea stars. The girls and I made this one together. My hands were to sticky, sandy to take pictures of the process. We have new pets! My kids are excited about this. I had the vases, and the glass beads at the bottom are from the Dollar Tree. 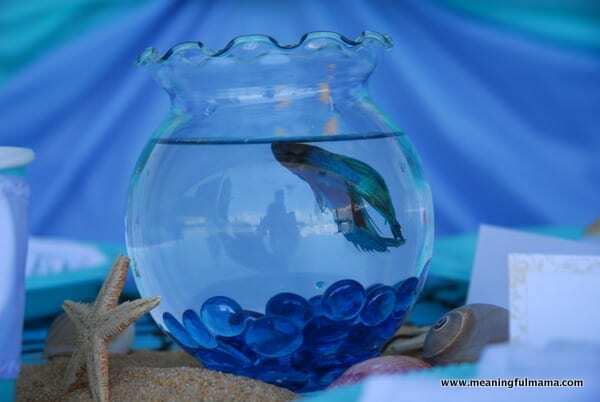 I considered giving the fish away as a party prize, but I’m pretty sure the kids are attached to “Alice” and “Mixed up, and I couldn’t bring myself to even suggest it. Other details include the plastic table cloth on a big roll, also found at Party City. 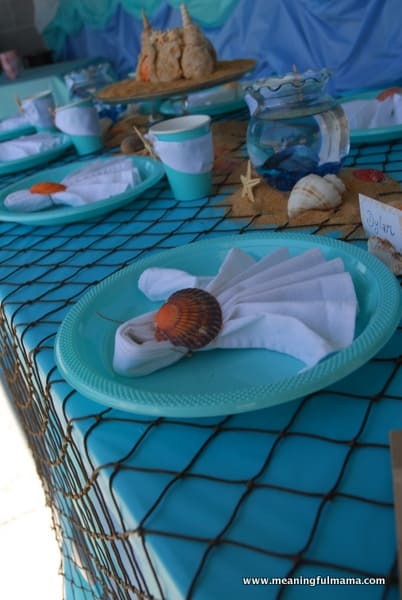 I was able to use these big roll table cloths in a few other ways, so stay tuned for more mermaid party decor coming soon. I put a fishing net over the table that I found at the Net Shed in Seattle. I actually originally found them on Ebay but noticed the local number, made a call and was able to visit their warehouse to figure out exactly what I wanted. These are recycled fishing nets, and I know you can contact the Net Shed for all over your fish net needs – whether it be for decorating or sport nets. I also got a 40ft fishing net from them, but you’ll have to come back to my other posts about the party to see how I used it. 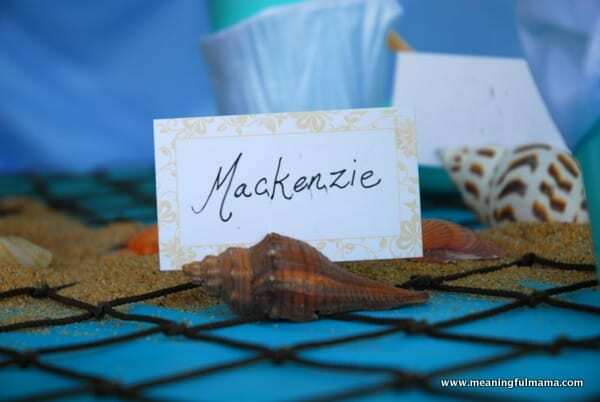 I decorated down the center of the table with more sand and shells. 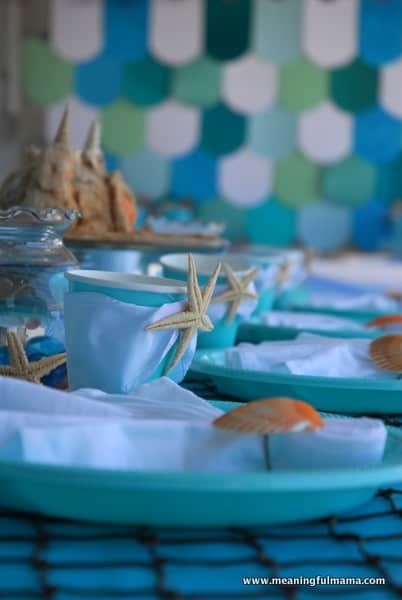 My goal was to make the girls feel like they were dining under the sea. You can see hints of more party decorations in the background, so I hope I have peaked your interest to see more. Thanks! I know some people look at the end result and just feel overwhelmed. I think it helps to break it down to make it all seem do-able. I’m glad it is helpful. Thanks for taking the time to comment!